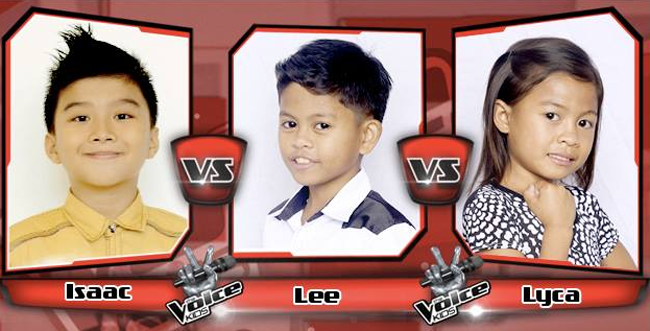 The fourth battle and it’s the last for the Saturday episode of The Voice Kids was among Lyca, Isaac and Lee. They were the only young artists who battled for a Tagalog song entitled “Isang Lahi.” This was chosen for them is because they fit for the genre of music talking about their voice quality. During the training, Sarah noticed that the three were trying to make their voice more audible to excel but that was not supposedly the case. She told Isaac and Lyca to lessen the vibrato. During the performance proper, the three presented themselves with authority and confidence in front of many people. There was shouting and clapping inside the hall as their voices resonated powerfully on the wall. The three coaches were also impressed because of what they have shown. Also Watch Replay: Musika, Gab, and Mitz with “A Thousand Miles.”, Triscia, Diana, and Hannah with “Better Days”, Darren, twins JM and JC, and Sam with the song “What Makes You Beautiful”. After they have performed, Coach Lea said that the three were really good. The coach also said that Isaac sang professionally and so with Lee. When it comes to Lyca, she said that she was small but terrible and she was reminded of Nora Aunor. Coach Bamboo chose Lyca due to the fact that she was good in emotion and she captivated his attention. Coach Bamboo appreciated the efforts of the three. Coach Sarah, the one who will decide who among them will advance to the sing-offs found it hard to pick among the three. She said that Isaac gave a high respect for her that he allowed himself to be disciplined and the result was good. Lee on the other hand received an advice from his coach to minimize shouting and control his voice. It was Lyca whom Coach Sarah chose because she sang like a superstar. The focus was there and she was very into the performance. Lyca was the fourth kid who entered the list of sing-offs candidates.